This eco-agricultural village in northern Thailand is the present home of four hill tribe groups: the Lahu, Palong, Lahu and famous long-necked Karen tribe. Built in 2005 as a cultural preservation project, the village brought together the different tribes into one community and became accessible to visitors. Set peacefully in the hills among rice fields and thatched-roof houses, the village grants the opportunity to experience hill tribe life in one place. Walk through the winding trails and see women wearing brightly colored textiles—many of them weaving and spinning clothes. 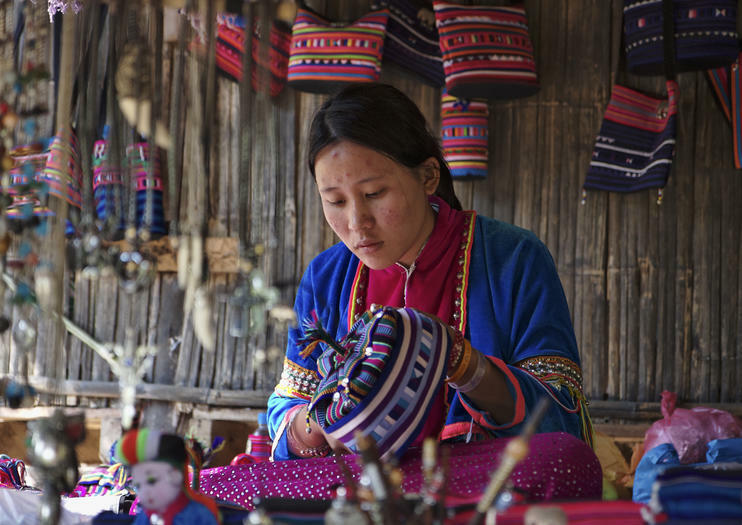 Many of the tribes have migrated from nearby Myanmar (Burma) and maintain their cultural traditions, including the wearing of several brass rings around women’s necks. There are various handicrafts on display throughout, including jewelry, dolls and textiles—the sale of which provides income for the people here. Outside of the cultural learning, most visitors enjoy the opportunity to take photographs and have conversations with the friendly residents. Baan Thong Luang village is located off Maerim-Samoeng Road, about 40 minutes from Chiang Mai by car. It is open during daylight hours, and admission is 550 Thai Baht for adults and 300 Thai Baht for children. Experience the best of rural Chiang Mai on a private excursion that combines several activities. Raft the whitewater rapids of the Mae Taeng River, zipline through the jungle, and learn about northern Thailand’s hill tribes on a visit to a local village. Top off the trip with a stop at the Elephant Poo Poo Paper Park, an eco-friendly outdoor museum. A buffet lunch is also included. Benefit from a full-day tour of attractions near Chiang Mai that features one of northern Thailand’s most important temples, Wat Doi Suthep, along with other highlights. Have more flexibility as you travel with your own private guide and explore the picturesque grounds of Palad Temple; visit an orchid and butterfly farm; and learn about local ethnic minorities at Baan Tong Luang village. Lunch at a local restaurant is included. Experience the indigenous culture and rich nature outside Chiang Mai on this guided adventure. After a convenient hotel pickup, travel with an informative local guide to the lands of local hill tribes like the Karen (long neck), Lahu, Padong, and Hmong. Then, visit an orchid and butterfly farm or a park where elephant dung is transformed into paper.